April is here, and with it, hopefully more showers – except on race days! It was a busy first quarter at CPYC starting with the Brrr Rabbit on New Year’s Day followed by a post-race Build-Your-Own-Bloody-Mary event. January 12th brought us the first race in the brand-new Winter Beer Can Series, which was such a great idea (thanks, Jack!). The Commodore’s Ball on January 25th was a smashing success (well done, Gary! ), and it was so nice to catch up with those of you we don’t see very often at the Oyster Point Brunch Cruise Out on the 26th. February started with fickle weather, as experienced by the racers in the Double Up & Back (super-light winds on the upwind leg, and then lots of breeze going downwind), and the Year of the Horse was welcomed to Coyote Point with a post-race Chinese New Year buffet dinner. The next day saw a full house at the Club for Superbowl, and the crab feast (thanks, Mark & Linnea!) kept the binge-eating going. The Winter Beer Can scheduled for the 9th was rained out, but Valentine’s Day on the 14th was a cozy event at the Club (bravo, Madlen!). March 1st’s John Pitcher Memorial Regatta was a real bobber, as only four boats managed to finish the race due to lack of wind and strong currents. However, that evening’s Mardi Gras party brought tasty gumbo and a packed dance floor (nice, Linda!). Because you can never have enough corned beef, we welcomed the Berkeley Cruise In with “An Evening in Ireland” on the 8th. A grand time was had by all at the Ballena Bay Cruise Out on the weekend of the 15th (good job, Rod! ), which may have been the first of its kind (at least to my knowledge) with an all-sailboat turnout. 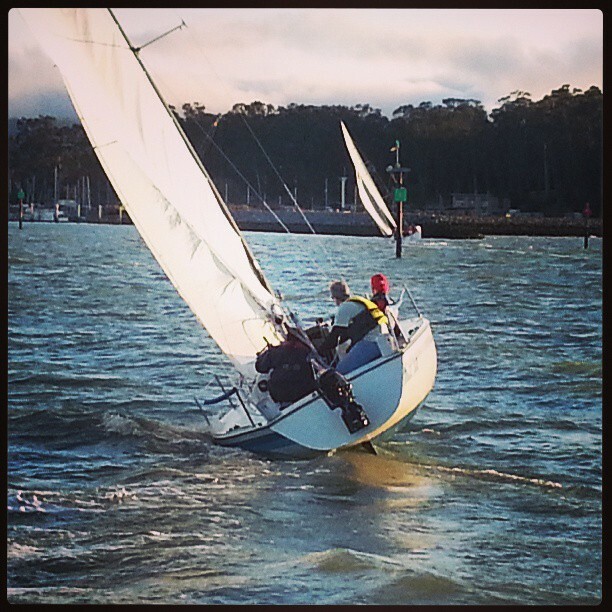 This was followed by another first – when I single-handed my boat in our informal race from Ballena Bay back to Coyote Point on the 16th (don’t think I need to do that again!). March 23rd brought a close to the Winter Beer Can Series with two races in one, and a hearty congratulations go out to the top three finishers in the series: Mark B (Smokin’ J), Luther (Paradigm) and Steve M (Moriah)! Second quarter is already looking pretty packed with fun events, so start marking your calendars now for the following events! April 16th – Wednesday Night Beer Cans start for the season! We are looking forward to seeing more of you, more often!